The British rail infrastructure owner Network Rail is currently in all sorts of trouble. Its five-year investment plan is rapidly unravelling with increased costs on its Great Western Main Line electrification programme, while other electrification schemes on the Midland Main Line and Trans Pennine routes have recently been ‘paused’ (whatever that turns out to mean in practice, poor old Midland Main Line) by the UK government. Rising costs, changes in scope and predicted delays are the culprits here. Meanwhile, punctuality of trains across the network is declining, at least some of which seems to be due to increased infrastructure-related delays. For those with long(ish) memories, this all seems slightly redolent of Network Rail’s not-all-that-much-lamented predecessor Railtrack, which imploded spectacularly after the government lost patience with its inability to manage its existing infrastructure and deliver enhancement projects. It’s fair to say, I think, that the infrastructure companies of Britain’s privatised railway have been one of its more troubled parts. Having said that, by Railtrack standards Network Rail’s troubles (despite the angst they’re currently causing) don’t seem quite so bad. After all, Network Rail hasn’t presided over a complete ‘meltdown’ of the national railway network, the post-Hatfield train crash response of Railtrack to its sudden discovery that it didn’t know how to look after its main asset, the track, nor indeed very much about its assets at all. When British Rail was broken up and privatised in the late 1990s, the train-operating franchises were let to private sector bidders or management buyouts. The national railway infrastructure (track, bridges, tunnels, signalling system, stations) was vested in a company called Railtrack. It was always the then-government’s intention to sell Railtrack off, and it was floated in 1996. Railtrack’s rail infrastructure maintenance and renewal obligations were subcontracted to other private sector engineering companies. There were dire warnings from observers of the railway industry that Railtrack’s structure was flawed, and it was always a slightly bizarre private-sector company, because its main income stream was in track access charges from train operators, who were often subsidised by the government to pay them in the first place. So Railtrack was in the private sector, but reliant – at one remove – on public sector funding. As a private company with shareholders, it was also intended to be a profit-making, dividend-paying company. As such, warned some, there was always going to be a temptation to cut costs to boost profits and dividends. That was because it could neither increase the price of its main product, paths on the national rail network, because its pricing structure was regulated; nor could it make many more train paths available, because the railway network had little spare capacity. Cutting costs isn’t a particularly good idea when most of those costs are in the maintenance of the railway infrastructure, and are essential to maintain the safe operation of the railway network. But that bird wouldn’t come home to roost for a few years yet. In its early days, Railtrack had the buccaneering swagger of a true private sector innovator. And, though some people will never have anything but criticism for the company, it did get some things right early on. For a start, it significantly improved the retail environment of the major stations it operated. It was also under Railtrack that the modern era of station cleaning and refurbishment started. 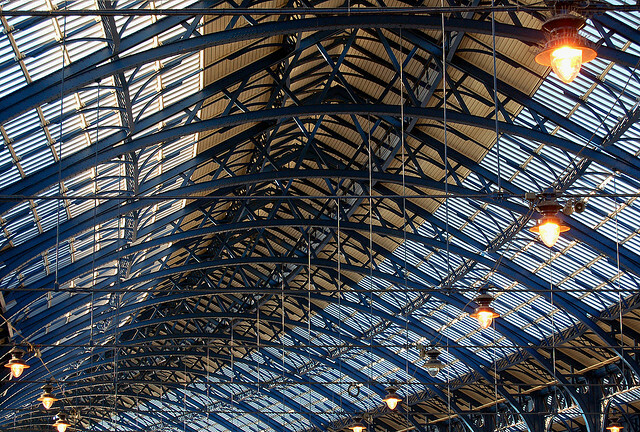 Stations like Waterloo and Brighton saw the grimy, dirty, glazing in their roofs replaced with acres of clear glass, on metalwork properly restored and sensitively repainted. Suddenly, at stations like these, there was light. British Rail, forever under the cosh of government funding limits, had never managed anything similar. This sort of project was perfect for Railtrack though, low cost (in railway terms, anyway…) with a big output that allowed Railtrack to demonstrate how it was looking after the national railway infrastructure. Railtrack was also surprisingly good at corporate graphic design. Commentators fretted over the flight of technical railway expertise from Railtrack, and the way railway engineering work had been outsourced to sub-contractors. But Railtrack’s communications team certainly had some railway expertise. From communications consultancy Lloyd Northover, Railtrack commissioned individual station branding for use at the major stations it directly operated. 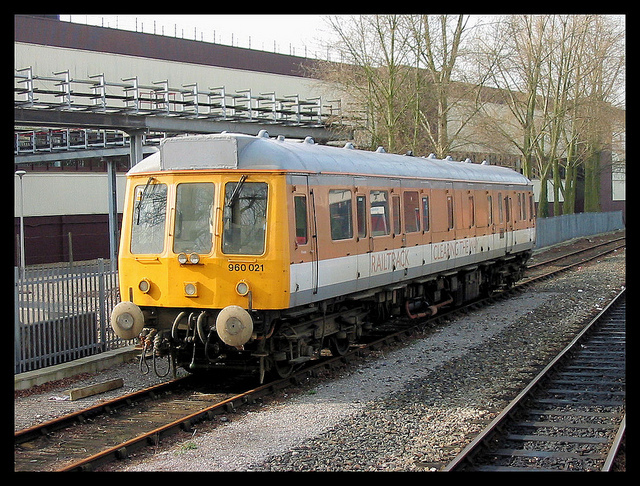 This was beautiful work, today sadly abandoned and which has seldom been bettered in the privatised railway. It was the topic of an earlier entry on this blog, which you can read here. The brand identities were complemented by a new typeface for use on signage at the major stations, Brunel, designed by specialist typeface design company The Foundry. You can see it here. The Brunel typeface is still used by Network Rail (in a slightly modified form called “NR Brunel” which you can see in this document), though Network Rail omits to mention that it was its predecessor Railtrack which was responsible for originally having it drawn up. Aside from Brunel on its station signage, Railtrack tended to use the Gill Sans typeface in its corporate communications, not to mention for its creditably simple corporate logo. Press releases, reports and the like used the stylish typeface adopted by the London and North Eastern Railway (LNER) from the late 1920s. For those in the know, use of Gill Sans calculatedly gave the impression of a company that understood the heritage of the railway it had inherited. Railtrack’s small fleet of rail treatment trains featured its Gill Sans logo and were finished in brown, an unusual colour for the modern railway. I’ve always wondered if, like Gill Sans, the brown livery was intended to recall the LNER’s practice of painting its carriages, even steel ones, faux-teak to match its wooden carriage stock. The Railtrack livery was later changed to a (deliberately, I assume) jarring combination of dark blue and lime green. Cover of a “leaves on the line” leaflet produced by Railtrack. There is a clear Art Deco influence in the highly stylised wheel and rail at top left, while the use of Gill Sans is also redolent. The idea of classic railway posters was also to form the basis for the amazing design work in its first few annual reports. Unfortunately, being good at design was something you would have wanted for Railtrack alongside actually knowing how to maintain, safely operate, and upgrade the national railway infrastructure. Sadly, however, it was in those other areas that Railtrack eventually proved not nearly so strong. Not that you’d have guessed it from the first of Railtrack’s annual reports, the one for 1996/97. Working with communications agency Stocks Austin Sice, Railtrack hit upon the wizard wheeze of presenting a summary of its key achievements as a series of five double-page illustrations. These were all based on the style of classic pre-war railway posters. A further illustration, “The Future” was reproduced at poster size, and wrapped around the cover of the Annual Report. All six were united around the common theme of “progress”. 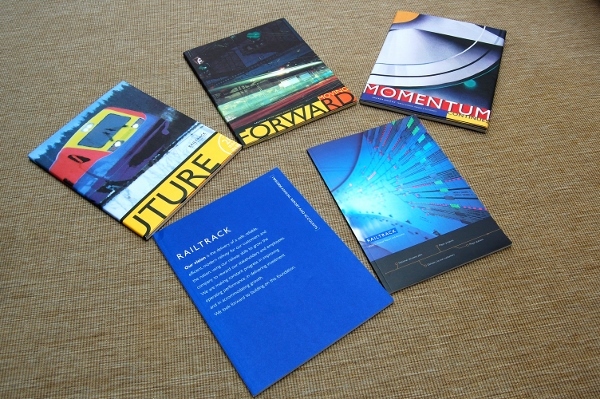 I have never, before or since, seen a company’s annual reports so attractively presented as Railtrack’s early efforts. They weren’t just annual reports, they were miniature collections of genuine works of art. The concept got some media coverage at the time (as in this story from Design Week, for instance, though you’ll need to register to read it), but it’s been virtually forgotten now. 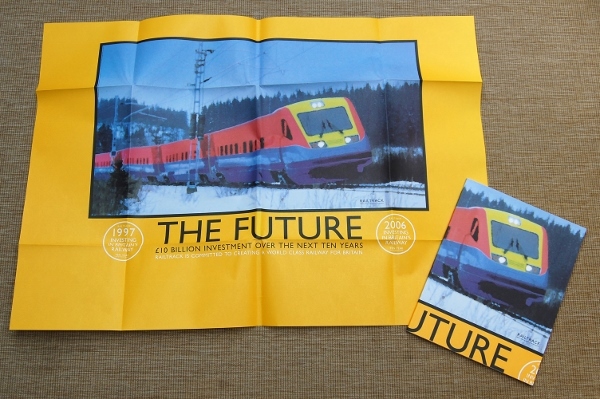 The “The Future” poster adorned one of the office walls at the transport news magazine where I worked during the final few years of Railtrack, and a very fine piece of decoration it was too. 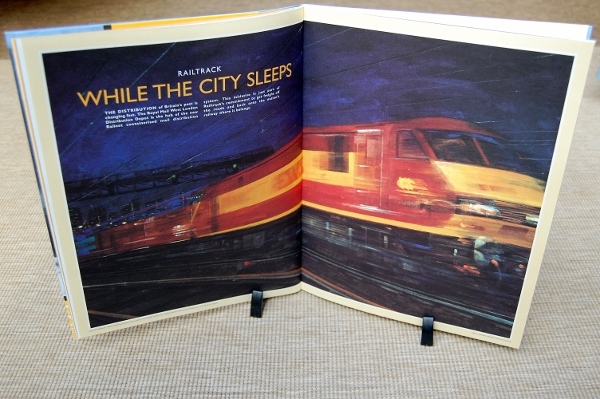 Inside the 1996/97 Annual Report, the five double-page illustrations detailing Railtrack’s key achievements were produced by five different artists. Debbie Cook‘s “£4 Million a Day” was a beautifully rendered illustration of track workers replacing railway line. Jeremy Sancha provided “A Close Partnerhip”, a lino-cut illustration of Ashford International station (you can see more of his work here). “Business as Usual” was a watercolour illustration of station regeneration works at London Paddington by Matthew Cook. “Working in ‘STEP'” by Andrew Davidson was a gouache painting of signallers in a control centre, and related to a Railtrack training programme. Perhaps the one most similar to a classic inter-war railway poster was “While the City Sleeps” by Fletcher Sibthorp, an evocative oil painting of a night mail train in London (I’m fairly certain this is the website of the same Fletcher Sibthorp, but I can’t be absolutely sure). Curiously, “The Future” is the only illustration not attributed to an artist so I assume it was either an in-house Railtrack effort, or produced by Stocks Austin Sice. There’s no way to illustrate this article without using photos of the artworks on/in Railtrack’s Annual Reports. These are obviously still within copyright. The images included above are used for the purposes of commentary/reporting, are low-resolution which cannot be reproduced as substitutes for the original works, and are photos of the Annual Reports as objects, rather than scans of pages. I was struck by the quality of this work when it came out. I think I still have them somewhere.